Hey guys! Happy Friday! Today was a pretty nice day. We slept in until about 8:45. Then I relaxed more with some coffee and went to an amazing Pilates class. Later I met a friend for lunch and chatted. The girls came with me and had a good time as well. It was also my dog’s birthday. Brutus got spoiled with some treats and toys. This afternoon I cleaned out the kitchen to see what I could make. I defrosted some pork chops and decided to come up with a new recipe. 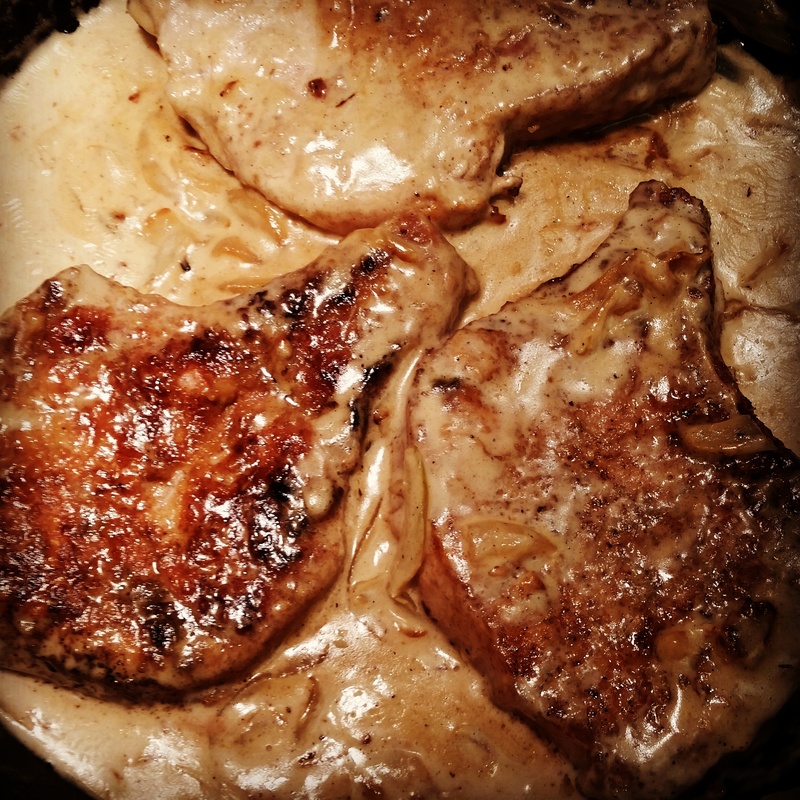 My kids LOVE pork chops and gravy, so I thought to make a gravy smothered pork chop with mashed potatoes and veggies. I turned on my I-pod, poured myself a glass of wine, and got to cooking. It felt amazing to get back in the kitchen. Everyone loved it, so this is totally going in to my pork chop recipe rotation. 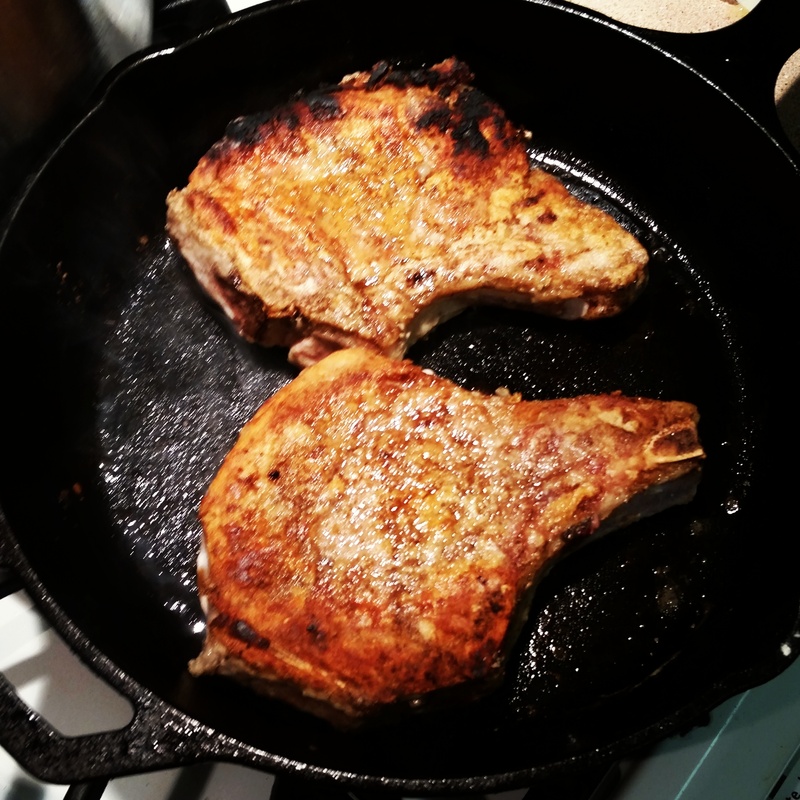 3-5 pork chops, 3/4-inch thick, bone-in—- you could do this with any pork chop; no bone or thinner pork chops need less time. Just reduce the browning time or time it is cooked in the gravy. For accurate cooking, use a thermometer. Take out at 145 and let rest for 5 minutes. It will come up to 150-160 and be perfectly safe to eat. Dry off your chops with a paper towel. Put the flour in a shallow plate/bowl and add the salt and pepper. Dredge the pork chops in the seasoned flour; shaking off the excess. Heat a large cast iron skillet over medium heat and coat with the oil. I used one large and one med. so I would not over crowd the pan. You may end up steaming them and they will not brown, so make sure you have plenty of room. No overcrowding! When the oil is hot, your pan should be smoking and ready for the meat. Lay the pork chops in the pan and cook for 3-5 minutes on each side until golden brown. Remove the pork chops from the pan and add a little sprinkle of seasoned flour to the pan drippings. Add more butter if necessary. Add your onions and cook them down, about 8-10 minutes. Mix the flour into the fat to dissolve and then pour in the chicken broth in a little at a time. Let the liquid cook down for 5 minutes to reduce and thicken a bit. Stir in the heavy cream a little at a time to finish the gravy and return the pork chops to the pan, covering them with the sauce. Simmer for 5 minutes until the pork is cooked through.